Dear applicants here is another grand opportunity for you to apply for Paytm Recruitment 2019 online. India’s leading and emerging e-commerce website is hiring eligible and talented employees for the current openings in several departments. Good news is that there is no application fee to apply and those willing to submit their online applications should rush to the online media and do it within the specified deadline. Find out more about the vacancies and the job profiles as per your qualifications and job requisite. The recruitment advertisement has been issued here as an informational topic for all the candidates seeking private sector jobs in Paytm. The organization is an online platform for mobile payments and e-commerce. Earlier, started with online mobile recharge and bill payments, today, Paytm has grown to cover over 250 million users’ needs and is now owned by One97 Communications network. Several multimillionaire brands have invested their shares in Paytm Bank Recruitment that include SoftBank, SAIF Partners, Alibaba Group, Ant Financial (Alipay) and Mediatek. The firm also homes most efficient workforce carrying out several processes to execute 24x7 customer services timely and accurately. In the recent online notice, the HR department has announced about different positions vacant in the company such as Project Manager, UI Designer, UX Designer, Field Sales Executive, Technical Architect, Software Engineer, etc. Read on to know which jobs are suitable for you and how you can apply for the vacant profiles. 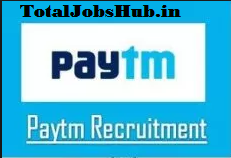 The Paytm Recruitment 2019 Application link is active now and those, who are willing to contribute to company’s growth and goodwill, need to check through these details and start filling their online form and submit their resumes depending on the job requirements and eligibility criteria. Recruiting Authority: Paytm One97 Communications. Jobs Available: Project Manager, UI Designer, UX Designer, Field Sales Executive, Technical Architect, and Software Engineer. Now, visit the following details and check your eligibility to suit a job according to your education and work experience. Please be informed that the selection is for both the freshers and experienced candidates. Kindly, review all essential information before applying online. The minimum qualifying education is a graduate degree in the relevant discipline from a recognized University. For Managers’ posts, applicants need to have a Master’s degree in Business Administration or Relevant Stream. For Field Sales Executive vacancies, a candidate needs to have completed degree exams in any stream. The minimum age to apply for the vacancies is 18 years while there is no upper age limit. Note: This is a private sector firm; hence, no government policies apply for age relaxation. Here is no application fee charged to the candidates whatsoever. There are three rounds of selection to qualify which are the Written Aptitude test (Professional Knowledge), HR Round, and a Personality Test. Employees shall receive best in Industry salary package which necessary allowances and promotional incentives. Find the about us page and look for the ‘career’ link or opportunities link. Follow it to reach the registration page and enter your academic, professional, and personal information. Submit your updated resume and provide your proper contact and email id for future correspondence. Wait for a call or email from the recruiter and prepare to appear for the interview and selection rounds. Kindly, note that further of the selection and process under Paytm Bank Recruitment 2019 shall take place at the headquarters of the organization. The corporate address of the firm is given hereunder. In case, any of you have any type of query, an issue regarding Paytm Recruitment 2019 please contact us through the comment box and we will definitely sort out your problem as soon as possible.